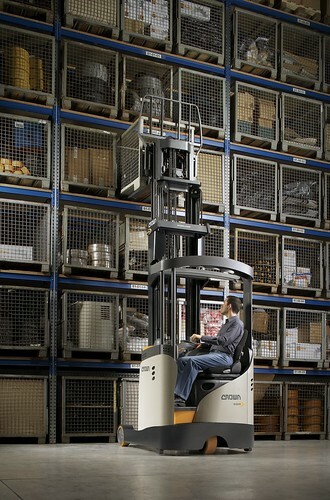 NEW BREMEN, Ohio (April 11, 2011) – Crown Equipment Corporation, one of the world’s leading forklift manufacturers, announced today that one of its forklifts has been honored with the prestigious GOOD DESIGN™ Award. The award’s sponsor, The Chicago Athenaeum: Museum of Architecture and Design, recognized the Crown ESR 5000 Series moving mast reach truck for its advances in ergonomics, visibility, application flexibility, and serviceability in confined spaces. According to The Chicago Athenaeum, a record number of submissions were entered for the 2010 GOOD DESIGN™ Awards, representing influential corporations in the design industry from more than 48 countries. This marks the third international design award for the Crown ESR 5000 Series and the 10th GOOD DESIGN™ Award for Crown Equipment. The Crown ESR 5000 Series, which is available worldwide, provides an optimized work environment that positions operators for precise control, better visibility, reduced fatigue, and easier access to tools. The cabin features a larger work space, 30 percent more leg room, and a rotating MoveSeat™ with headrest and FlexBack™ for all-day comfort. Operators can choose between three control configurations including multi-task, fingertip and dual-lever controls. Crown’s 360 Select™ steering system allows the operator to choose between 180 degrees and 360 degrees steer tire rotation to match driving conditions, skill level or personal preference, and operators can also adjust the steering column to find a comfortable driving position. The Crown ESR 5000 Series also offers a clear-view mast and patented overhead guard that minimizes obstructed views during driving and lifting operations. The panoramic view fork carriage features an integrated sideshift and tilt. 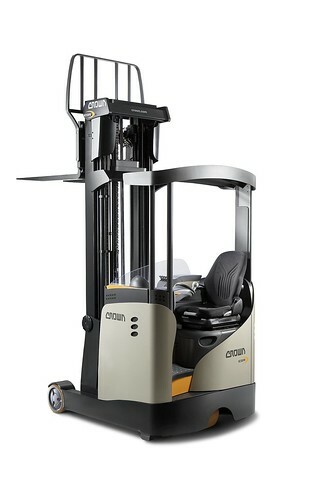 Crown Equipment’s Access 1 2 3® comprehensive system control enhances the safety and productivity of the Crown ESR 5000 Series by allowing adjustment of the forklift’s performance and driving characteristics to meet user preferences and specific warehouse applications. In addition to the GOOD DESIGN™ Award, the Crown ESR 5000 Series has been recognized by the Industrial Designers Society of America (IDSA) with a Gold International Design Excellence Award (IDEA) and an International Forum (IF) Gold Award. Now in its 60th year, the Museum’s historic Good Design program was founded in Chicago in 1950 with the participation of early modernism’s most formable designers including Eero Saarinen, and Charles and Ray Eames.